I have been doing freezer meals (freezer cooking) off and on for a little over fourteen years now. I love it, and can’t even imagine going back to my old way of doing meals (which was so pitiful we won’t even go there)! However, my story was not without a bit of a rocky start. In fact, my freezer cooking story almost ended just as soon as it began! While I’m very glad that I stuck it out, and finally got to where I am now, I’d like to help those who are new to freezer meals and freezer cooking (and even those who are not so new) avoid some of the pitfalls I encountered. 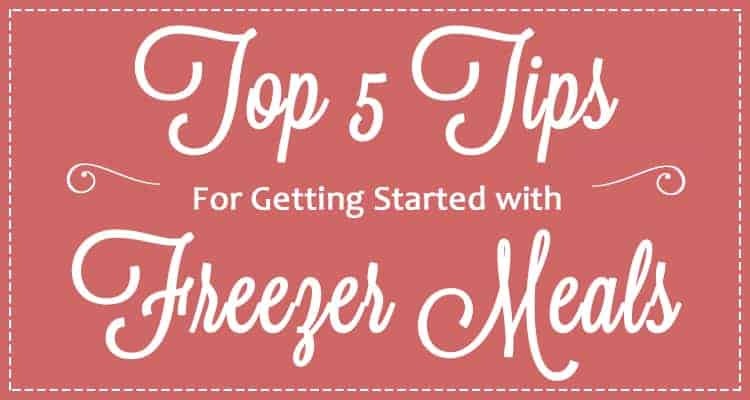 So here are my top five tips for getting started with freezer meals & freezer cooking. You’re excited and ready to go! You like the idea of saving time and money (and hopefully your sanity) by prepping meals in advance, and you want to get started right away!! I get it. I totally do. But trust me on this one – you don’t want to start too fast or take on too much at once. It’s very easy to get overwhelmed when you over-plan a cooking session. It happens – even to us “pros” who’ve been doing this for some time now. Start small. Pick one recipe you like, and make two of that recipe – one for that night’s dinner, and one to go in the freezer. Once you get an idea for what is involved, you can take on more recipes. I didn’t give up, because I still like the whole idea of it, so I tried again a year or two later. But same story. So I gave up…again! Fast forward a few more years, after a stint where I was able to do those “come to our store and we’ll prep everything for you and all you have to do is put it together and take it home” deals (which unfortunately didn’t pan out well as a business model, darn it, because it was really convenient for me), and I decided to give it one more go. This time, I had read about doing “mini sessions”, and I decided to give one a try. An easy “1-protein-5-different-meals” kind of thing. IT WAS A NIGHT & DAY DIFFERENCE!! THIS was doable! And I’ve been doing “mini” sessions for freezer meals ever since. Now, this is not to say that there is anything wrong with the big freezer meal sessions, because there isn’t. But you can’t just go right out and run a marathon tomorrow if you haven’t spent some time training for it first. Moral of the story: START SMALL. There is nothing worse than getting all excited about a new recipe – getting all the ingredients, putting it all together, and then sitting down to eat, with great expectations, only to find out that the meal is an absolute failure! The texture is wrong, it doesn’t taste like what you were expecting, the kids won’t eat it, etc. Now, imagine spending your time (and money) putting together four copies of a meal, only to find out that you hate it, and now you’ve got four freezer meals that you don’t even want to contemplate eating ever again. Food wasted. Time wasted. ALWAYS do a trial run of all new recipes before adding them into your “tried and true recipe” rotation. 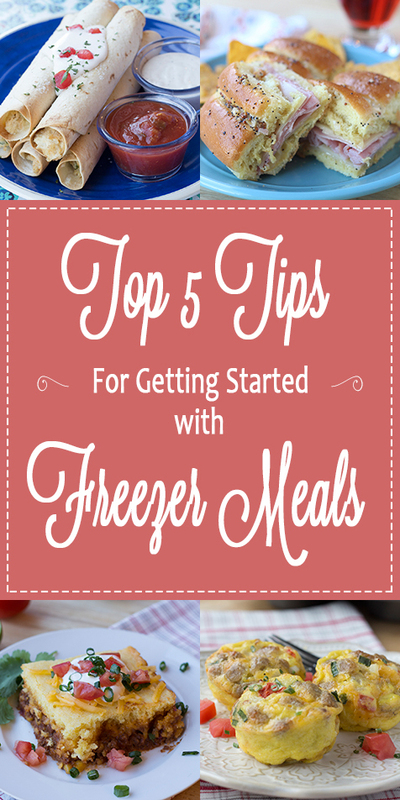 Every freezer meal can be made fresh, without freezing first – do it! Once you’ve made the meal once, then you can cautiously add it to your next freezer cooking session. But even then, start small. Only make one or two, to test how it freezes and whether you still like it as a freezer meal (versus the fresh version). Sadly, a lot of great recipes don’t always translate over well to the freezer. As you gain more experience working with freezer recipes, you’ll be able to better spot the problem recipes early on. But when you’re first starting out, save yourself the grief (and the time and money) – do a trial run of all recipes BEFORE you make multiples for your freezer. I have read so many articles, from novices and pros alike, even from college extension offices, about what foods freeze well and which ones don’t. And I can tell you that there are a lot of differing opinions out there on the matter. Some say to never freeze dairy products, some say breads and dough will not freeze well, some say that you’d have to be crazy to try to freeze a cream sauce. Some say you can freeze any vegetable no problem. Honestly, my personal experiences have been somewhere in the middle of all of this. I grew up in a family where we routinely froze our milk and bread. Regularly. Like, religiously. My dad was in the Air Force, and to save money, we shopped at the nearest base commissary. However, that commissary was about an hour away. It wasn’t someplace we could just run down the street to when we ran out of milk. But the prices were great! So, once a month or so, we would head to the commissary, my parents would grab four shopping carts (yes, FOUR), we would fill one with just gallons of milk, one half full with loaves of bread, and then fill the rest with whatever other groceries we were needing. In fact, looking back on it, we had a grocery store about 3 blocks from our house, but I have almost no memories of ever going in there – ever. We would load up our little Honda Civic hatchback, and once we got home, all the milk and bread went into a big freezer in our garage. Then, we would pull some out and defrost it as needed. So when I read that you can’t freeze milk (or dairy), I just laugh. Now that I’m grown and in charge of my own freezer (ha ha), we don’t freeze milk. Not because you can’t, but #1) because I’m allergic to it, and #2) while the idea of freezing milk does not bother me, when my husband tried milk after it had been frozen, he said he could taste a difference. Me, I couldn’t. But who I am to force my crazy milk-freezing ideas on my poor husband? So, we don’t freeze milk. But I know lots of people who do. It CAN be done. I regularly freeze butter, yogurt, sour cream, cream cheese, cheese and even whipping cream without any problems. BUT – that’s not to say it will work for everyone. My point being, familiarize yourself with the basics, but don’t feel like you have to take one person’s word as the gospel truth. Be willing to try things for yourself and see what works (and what doesn’t) for you and your family. I feel like this one sorta goes without saying, but I think it is important enough to mention anyway. Plan your cooking sessions around what is on sale. Chicken thighs on sale for .75/lb? Pull out a few recipes that use chicken thighs and do a mini session. Tortillas and eggs on sale? Time to make up some breakfast burritos! This is how you save money with freezer cooking. You get as many ingredients for your meals at the lowest price possible. Then you make multiples of those meals, or multiple meals featuring those sale items, and stick them in your freezer for later use. That way, even though you may eat that meal three weeks later, you’re still getting the benefit of the cheaper sale prices on those ingredients! This is yet another reason why I prefer to do smaller “mini” sessions over the big once-a-month plans. I could NEVER find all the main ingredients for a month’s worth of meal on sale all at the same time. So I was paying full price for most of the ingredients. I felt that when I tried to do the bigger sessions, I actually ended up spending MORE money on groceries overall, not less. When I do small batches of freezer cooking, I can easily put together a few recipes to best utilize what I find on sale that week. And I do feel like I’m saving more this way. Yeah, I cannot stress this one enough! There’s a lot involved, and a lot of little pieces that must all fit together to make this run smoothly. When it does, it is wonderful!! It is such a great feeling to see all of your hard work come together in great meals for your family that you can stash in your freezer for easy/quick/fast meals later on. But when a session goes wrong, it can be SO aggravating! There are a bunch of resources on the internet, where others have already put together plans and recipes and shopping lists for you. When you first start out, I highly recommend looking at some of these, and either using them outright, or modifying them slightly to fit your needs. Take advantage of the work that has already been done for you. As you do more freezer cooking, you’ll soon get the hang of putting together your own plans. I also recommend looking into using some sort of recipe software for storing your freezer meal recipes. Most recipe software has basic meal planning functions available, and will allow you to plan out a week or two (or more) of meals using the recipes you’ve entered, and then the program will generate a shopping list for you with all the needed ingredients! So handy! My personal favorite right now is Pepperplate. Best part? It’s free and it works across multiple devices. (I’m not affiliated with them in any way or sponsored by them – I just like their product!) I can access my recipes from my desktop, on my tablet in the kitchen while I’m cooking, or even on my phone right in the grocery store if I think I may have left something off my list and need to check the recipe. I’m sure I’ve left out a bunch of other helpful information, so if you have questions or comments, post ’em below! I’d love to hear about everyone else’s experiences with freezer meals and freezer cooking – good, bad or otherwise!